When Dr. Millay is not in the office, he enjoys archery and other shooting sports. He is an avid outdoorsman and an excellent marksman. He enjoys working out or running daily and spending time at his farm. He and his wife Christy are members of Edgewood Baptist Church where they serve as greeters. Christy is a former United States Congressional staffer and is currently a board certified Family Nurse Practitioner completing her doctoral degree. Dr. Millay's stepdaughter, Abby Jo, is a senior at Murray State University studying Organizational Communications and Sports Communications and has been accepted to study at Belmont University School of Law in Nashville, TN beginning in the fall of 2019. 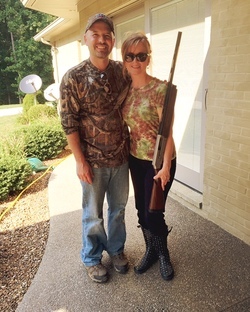 Together, Dr. Millay and his family enjoy dove and turkey hunting, shooting sporting clays, watching Netflix, eating Japanese cuisine, and playing with their five-year-old dog, a very lively and spirited Schnoodle named Sam.